The book. 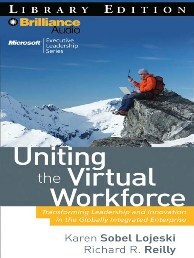 Karen Lojeski and Richard Reilly wrote Uniting the Virtual Workforce. The cover has the picture of a person on a mountain top with his laptop and I borrowed the book from the University of Manitoba Management Library. I thought I’d give it a scan and I didn’t think I would get too much from it. Wrong again. Was I wrong! I became enthralled by the work of Lojeski and Reilly and instantly was making notes on how to enact what they wrote about for projects I am involved in. 80% plummet in work satisfaction. 20% of people have never met their boss? One startling statistic the author cite is from a recent Stanford University study: one out of every five professionals has never met their boss. Distance is more than space. The authors outline the sources of distance: affinity distance, operational distance, and physical distance. Trust: Benevolence, ability, and integrity. One of the strengths from my perspective of the book was the section on trust and the challenges that distance places on trust. In distant communication we still receive the cognitive elements of trust but the affective elements are a challenge. Benevolence, ability, and integrity can influence trust and distance can tax these pathways to trust. Be DUMB. I am so tired of the acronym of SMART goals it was refreshing to have the authors advocate virtual dumb goals: Direct, Understandable, Meaningful, Believable. Gems. I believe the authors offer a number of gems that would enhance and foster the engagement of the virtual workforce. I encourage you to read the book to get a fuller understanding of the complexity of distance and the virtual workforce and the methods the authors advocate to unite a virtual workforce. 6 Personal Virtual Engagement Actions. I am now very attuned to distance even with people just a few feet away. I have ensured that I increase my phone contact with others instead of an over-reliance on email. I do my best to arrange at least some initial face-to-face time. I will try and have pictures of the people I work with at a distance and have video calls whenever possible. I now have a goal to meet as many of the members of my employee engagement network members as possible. I will gain proficiency and experience with webinars to try and shorten our affinity, operational, and physical distance. I encourage you to go the distance with Lojeski and Reilly. The trust issue is the key in this. If there is no trust, not a lot of work gets done. In a global economy, the problem is that one in five people will never meet their manager. It isn’t like you can go out on a Thursday night and have a beer with your team and know them better. Distance is clearly the challenge in a global economy: how do we know someone to trust them when they work on the other side of the planet? How engaged will they be in our shared goals? I think trust just keeps building more and more as they key issue. Good points. I agree with the importance of trust. But trust is an emergent property. I trust you if we communicate, if you seem to care about me at some level and if you keep your commitments and tell the truth. You trust me if I do the same. Violate any of those behaviors or expectations and the trust you built for years can collapse quickly and will take even longer to build back. It is sad when trust has built over many years and collapses so quickly when violated. Thanks you for the feedback and the recommendation I will read the book for definite. Our work force are mobile installing equipment into peoples homes. I do agree trust is a big part of engagement for me. It is a valuable source. I hope you find it helpful.